Women 58 yo, 5 years before being biopsy of a right breast tumor which was fibroadenoma, and now she detected herself a breast tumor on the left. Ultrasound scans at right breast (Fig.1, 2 CDI, PWD) and left breast in which was found a big cystic tumor with septation and axillary nodes on the same side (Fig.3, 4). Mammography is done showing the left breast tumor with axillary nodes in suspection malignant tumor T2N1. MSCT no CE also suspected breast cancer T2N1Mx. 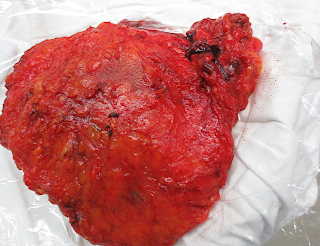 We performs FNAC of left breast tumor, the result is cancer, but the axillary node is not yet reported. Do you thing the ultrasound image of this lymph node and CT scan can make diagnosis ?. Mastectomy is done on left breast with one removed bloc (see 2 pictures). Microscopic lymph node report of this axillary nodes is chronic inflammation. Clasification of TNM of Breast Cancer is not based on the images of axillary nodes by ultrasound or mammo or CT, but based on clinical palpation.